In this beautiful volume, a love letter to American food, Martha Stewart, who has so significantly influenced the American table, collects her most favorite national dishes, as well as the stories and traditions behind them. These are recipes that will delight you with nostalgia, inspire you, and teach you about our nation by way of its regions and their distinctive flavors. Above all, these are time-honored recipes that you will turn to again and again. Organized geographically, the 200 recipes in Martha's American Food include main dishes such as comforting Chicken Pot Pies, easy Grilled Fish Tacos, irresistible Barbecued Ribs, and hearty New England Clam Chowder. Here, too, are thoroughly modern starters, sides, and one-dish meals that harness the bounty of each region's seasons and landscape: Hot Crab Dip, Tequila-Grilled Shrimp, Indiana Succotash, Chicken and Andouille Gumbo, Grilled Bacon-Wrapped Whitefish, and Whole-Wheat Spaghetti with Meyer Lemon, Arugula, and Pistachios. Martha Stewart is the author of dozens of bestselling books on cooking, entertaining, homekeeping, gardening, weddings, and decorating. 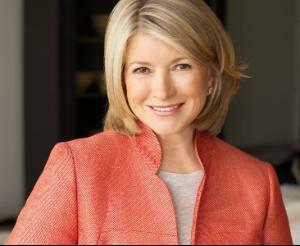 She is the host of The Martha Stewart Show, the Emmy-winning daily syndicated television program, and founder of Martha Stewart Living Omnimedia, which publishes several magazines, including Martha Stewart Living; produces Martha Stewart Living Radio; and provides a wealth of ideas and information on her website.